As I’ve mentioned before in this column, I’m a huge fan of taco trucks, and that same love extends to small “authentic”-feeling joints that sell forearm-sized burritos for $5.50. I don’t know if it’s a case of conditioning, because in college a trip to the taco truck also usually meant stocking up on blunts (which, after gutted and burned, generally makes the food that much better). That said, I generally ride with any truck, red-eyed or sober. I’m so attuned to all the fixings of a super burrito, the excess of every ingredient on a nacho plate and $1.25 tacos that when it comes to any sort of upper echelon Mexican food spot, I never quite enjoy myself. It sounds crazy I know, but it’s like the cheap joints don’t have the setting to entice you so instead they have to earn your adoration with the food alone. I calmed down and decided on a carnitas burrito, which later proved to be a great choice. My only surprise came when I asked the waiter what came in the burrito, and after foreshadowing my response with a look of surprise he replied, “Well there is some pico de gallo.” I’m telling you, I’m spoiled by slabs of avocado, cilantro, onion, lettuce, tomato and whatever else you can stuff in a burrito, and an empty burrito sounds kind of boring. When the food arrived, that wasn’t too far off from the truth. I will say that the carnitas was excellent. It was lean, tender and full of flavor. I could have eaten a full plate of it, but it made me wonder why once you wrap something in a burrito it becomes a burrito. It was literally just carnitas in a tortilla, with a little bit of pico thrown in for flavor (they could have easily topped a regular plate of carnitas with the same outcome). The whole thing got devoured, but for $9.50 I expected a lot more. Of course the “burrito” was served with rice that I could have done without and a bowl of black beans that made up for the sub-par rice. I ate everything, so again unlike the cheaper joints, I didn’t have a second meal to take home and enjoy later on, and trust me I budget meals like that. My girlfriend got the vegetarian burrito, which consisted of a bunch of grilled vegetables. She said it tasted good but wished it had the regular burrito fixings of avocado, sour cream, anything that resembled the traditional Californian burrito. In the end, the food was good, but I felt like I could get more for half the price at the spot down the street. 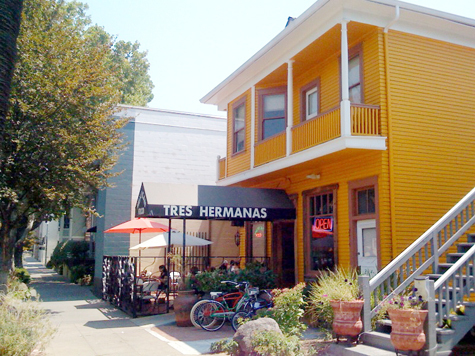 In the case of Tres Hermanas, I think you go there for the full dining experience, so if you’re taking friends or date, it’s a good place, but for the casual lunch burrito, it’s not the spot.